Kolosek is a remote development company. We can proudly say we know a thing or two about how challenging it is to be this type of company. Over the years, we have managed to overcome some obstacles of remote development, but that doesn't mean that there are no real cons of remote development. Before we begin with sharing our experience, it is important to emphasize that Kolosek is not a just remote development team, we are a company, an organization. Please keep in mind that we don't have similar issues with a group of developers which are a part of remote development team. We are going to give you a real perspective on what it's like to hire a remote development company. First, let's start with the bad news - the Cons. When it's time for the product update or a bug pops up in the application, having a development team under your roof is probably the best option. However, you can easily solve the problem by defining the terms of the contract. Remote development company should, periodically, do the application update. The same thing goes for bugs. Different time zones can cause multiple problems. We can't lie - it is much easier to have an in-house team that you can easily talk to, whenever. On the other hand, the language barrier is a real thing. You have to be aware of the fact that English may be a second (or third, fourth?) language to the most remote development companies. The light at the end of the tunnel is the fact that English dominates in the IT industry and most of the developers know how to speak it well. Finding a remote development company is time-consuming. You have to do multiple types of research, on and offline, in order to find the one organization that is right for your company. Jokes aside, having to go through interviews, visiting company's headquarters and assigning tests is definitely not the fun part. Now, let's get to the Pros. Remote development companies have a person that is in charge of managing the development team. Management issues solved! We don't want to brag, but most remote development companies hire only professionals. Keep in mind there is always a reason why a freelance developer is just a freelancer - the lack of professional or soft skills. You can hire a remote development company to work on multiple projects. Of course, there are some factors that should be considered, like how complex the project is, how many team members are in the company, what the goal of the project is etc. This is the most obvious advantage of all of them. No paying taxes, office maintenance, and insurance. The development company takes care of all that. Lowering production cost and still getting a quality team of professionals is a huge benefit of hiring a remote development company. 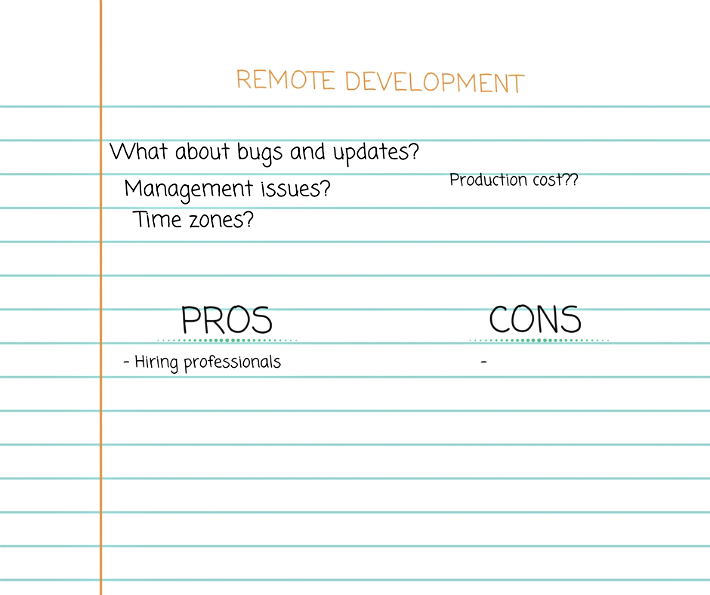 When we put lowering the production cost aside, there is an equal number of Pros and Cons of remote development. However, we wouldn't call it a tie. The biggest advantage of remote development is not lowering the costs, but the fact that all of the Cons can easily be turned into Pros. Fixing product bugs and updating the product on time should be included in the contract, so there is no issue with that. The language barrier can be overcome by hiring a team that has good English knowledge. Trust us, you will be able to tell if they are right for the company after the first Skype call. We have to admit, finding a remote development company might be the biggest issue so far. There is a solution for this problem, as well. We say go with your gut and never forget about word-of-mouth marketing. Maybe someone you know knows a person who knows a good remote development company... you get the picture. Also, have you read our previous article on what the most important resource for the SaaS company is? Here's a hint: the one that create the greatest intangible resource. Thank you for taking the time to read our blog post! We hope it has helped you decide whether or not you like to try hiring the remote development company.